“Illegal” ex-Immigration Minister Mark Harper has been appointed Conservative Chief Whip. Harper resigned from his post after he was found to have illegally employed Isabella Acevedo last year. Harper was given another ministerial job days later. Isabella Acevedo (who Harper employed to clean his flat for £22 per week) was seized by immigration police at her daughter’s wedding, sent to Yarls Wood and deported to Colombia. Though protests did not stop Isabella’s deportation it became clear, after an unprecedented Home Office admission, that Isabella’s original deportation flight was changed because of “potential disruption by third parties”. 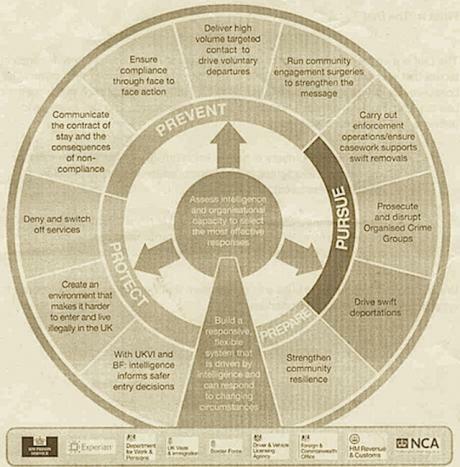 The Dial: Home Office resources to fight “immigration crime” and resistance from “third parties”. Come to the SYMAAG Annual General Meeting on Wednesday 20th May 7pm to discuss how we can organise support for migrants’ rights over the next 5 years. In particular we will look at how to take forward the Don’t Let Them Drown campaign for Mediterranean migrants. The situation is urgent: The UK Government along with other European Union countries is seeking UN backing to send warships to “neutralise” ships to carry migrants across the Mediterranean. Our guest speaker at the AGM is Tesfamhret Tsegazghi from Eritrea who will speak about why people leave countries like Eritrea looking for safety and security in Europe and how we can support them. The meeting starts at 7pm at Central United Reform Church on Norfolk Street, opposite Crucible Theatre (doors open at 6.30 for a cup of tea). This entry was posted in Asylum, Campaigns, General, State repression by Admin. Bookmark the permalink.